Half of the family has finished their dinner. So open the garden up we did. The big people will eat later. After we reheat of course! So here are my buffalo chicken wings…minus the celery and the blue cheese dipping sauce! Bread (from the freezer) and butter ($.79) On Manager’s Special of course! 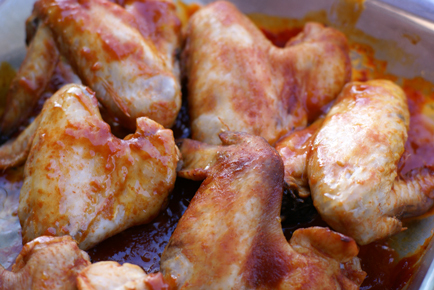 Marinate the wings in the hot sauce for at least 30 minutes, ideally overnight. Or better yet, freeze the wings in the sauce and let marinate as they thaw. Bake wings and sauce at 350 for 30-35 minutes, or until no longer pink. Steam broccoli in stovetop steamer or in a microwavable bowl with some water, covered with plastic, for 4-5 minutes. Too distracted by the garden! And cleaning dirt from my fingernails! 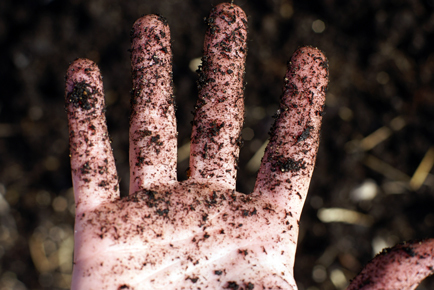 Dont you just LOVE gardening? I planted my “summer” seeds last week and already over half of them have sprouted! I’m so excited. That’s funny, I made bonelss hot wings for dinner tonight too! I took advantage of the Free Franks Hot sauce coupon and made a sauce for homemade chicken nuggets, served with corn and green beans. Yum! Yum! I’ll be using the other bottle of $.19 Franks to make some sauce! I’ve been digging in the dirt everyday with the good weather. I can’t wait to get the garden planted. They had fun! Now that the planters are ready, it’s seed time! I’m so glad I’m not the only one who works outside with the threat of snow coming!! I built one of the 4f x 4f containers today. It was absolutely gorgeous outside! I’ll end up making 5-10 containers for family soon as long as we have more days like today!! Wow, you found chicken wings on sale for cheap! It seems that somehow, wings are always one of the more expensive parts of the chicken these days. I can buy any chicken part for under $2, and whole chickens for less than $1/lb, but chicken wings? $3/lb. What’s up with that? Anyway, yummy wings! This is a favorite in our household as well! And great job getting started on the garden. I did this last weekend as well. Of course, tomorrow, they’re saying it’ll be below freezing and a slight chance of flurries…oh well! I am sorry for your loss of a family member, God bless you & your family. I live in Buffalo. We do not call them Buffalo Wings we call them chicken wings. LOL I love them and could eat them everyday! Franks Red Hot sauce is the best!